Well, apart from Brad Dexter, who lives on as a pub-quiz answer. And Horst Buchholz. Who? Exactly. Amazingly, the film’s best role – made famous by Toshiro Mifune’s feral, ferocious performance in Akira Kurosawa’s Seven Samurai – went to a German actor making his American debut as a Mexican gunfighter called Chico. Go figure. But remaking Kurosawa’s original – itself inspired by John Ford’s saddle-sagas – as an all-star Western was a no-brainer. It remains one of the most entertaining movies in the genre, as Hollywood alpha-males Yul Brynner, Steve McQueen, Charles Bronson, James Coburn and Vaughn crank up the charisma to play seven gunslingers hired to defend Mexican peasants from Eli Wallach’s pack of greedy banditos. Stage-trained Wallach took it all very seriously indeed, asking locals to teach him to shoot and snarl, not to mention having actual bandits play his henchmen. Everyone else just had a blast. Despite having genre classics Bad Day At Black Rock and Gunfight At The OK Corral under his belt, director John Sturges was no Kurosawa – emotional depth and pulsating tragedy are jettisoned in favour of popcorn fun and macho posturing. There’s a ton of both to be had watching McQueen attempt to steal every scene away from Brynner. If the two stars’ ego-joust during shoot is old news, there are countless fascinating pieces of trivia to chew on, served up via this Blu-ray’s superb commentary (Wallach, Coburn, producer Walter Mirisch, assistant director Robert Relyea) and Making Of doc Guns For Hire. Choice cuts? 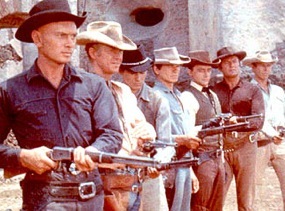 How Brynner, who initially intended to direct, registered the title The Magnificent Six when he thought one of the characters would be dropped. How McQueen faked a car accident in order to escape a TV series he was contracted to in order to do the film. How Anthony Quinn sued Brynner after being excluded from the project. How Chinatown’s genius cinematographer John Alonzo began his career as an actor in the film. How Kurosawa was so impressed that he sent Sturges a ceremonial sword as a gift. No one know if he saw the three sequels, but mercifully, they aren’t included. Both extras – along with trailers and stills – are jacked from the Special Edition DVD, but this Blu-ray gives a noticeable pump to the visuals. While there’s still some dirt and damage on the print, this is probably the best The Magnificent Seven has looked on the small-screen. A full-tilt restoration is surely just a matter of time. Hopefully Vaughn will get to see it.